Access All Areas members have a really cool collection of retro grid landscapes to download today, courtesy of Kim from MiksKS. Inspired by retro-futuristic aesthetics, these wireframe images of mountain scenes are the perfect resource for creating vibrant 80s style artwork. There’s 40 vector grid landscapes to choose from with varied terrain structures—some with lots of mountains, others with not so many mountains! Combine them with the bonus abstract spheres to create your own virtual destinations. Hi! My name is Kim and since I was young I always enjoyed creating things, but it’s only recently that I’ve decided to put more energy into graphic design and digital art in general, and open a shop on Creative Market to sell resources. So far it’s been an awesome experience because I’ve learned a lot about designing digital products! I spend most of my time in my studio (aka natural environment), where I create brushes for Procreate, textures, graphics elements and text effects. I’m inspired both by past eras, retro/vintage aesthetics, and futuristic and sci-fi universes, so my shop is some kind of anachronic mix of these inspirations. 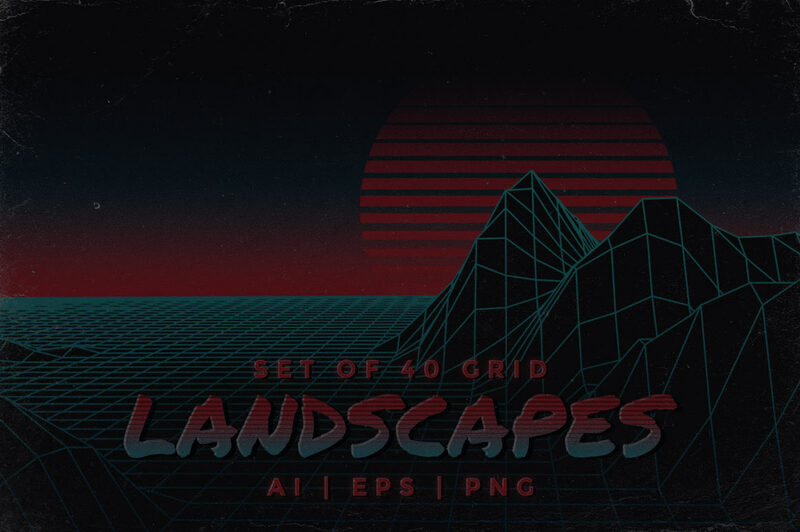 Included in this collection of retro inspired grid landscapes are 40 scenes in AI, EPS and PNG format (6000 x 4000 px, 300 DPI with transparency). Also included are 4 bonus abstract spheres and a detailed PDF tutorial explaining how to create a retro inspired scene using the grid landscapes, with pictures. Hmmm…. These could be interesting. Thank you! Glad you liked it, courtesy of Kim. James White would be proud!